In case there may be someone who hasn't heard, there will be a transit of Venus across the Sun on Wed 6th June. The 6-hour journey will start at about 8.30 am and finish around 2.30pm and Venus will move from the lower right to the lower left quadrants of the sun. It will all be visible from Eastern Australia. As always "eclipse glasses" or other form of eye protection is essential when looking at the sun. The last such transit was on June 8th 2004 but the next one won't be until 2117, so let's hope not to miss this one. 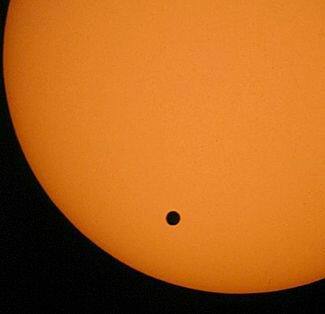 Venus as a small black spot against the sun.